Wonder what your teeth could look like straightened? Come for a FREE 3D Scan of your teeth. See how good your teeth could look with Invisalign braces! Invisalign is a custom made set of clear braces that you can easily remove for meals, brushing and social occasions. The aligners are custom made using 3D printing and scanning technology. They are changed every one to two weeks as they incrementally move your teeth into your ideal position. Your first visit is to really understand what you want to achieve and check that your mouth is healthy . We can take photos of your teeth and use our state of the art iTero 3d scanner to take an accurate record of the current position of your teeth and show you what your teeth could look like. 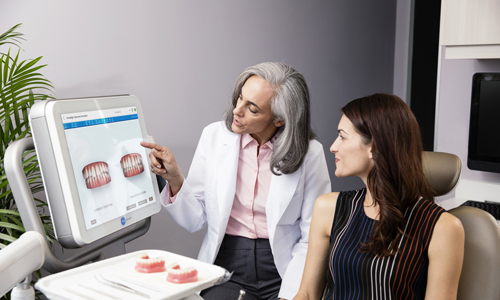 We send your digital 3D scan to Invisalign who create a video simulation of how your teeth will look as they gradually straighten to give you a preview of your final result. Once we have finalised your treatment plan and reviewed your Clincheck we will fit your new aligners and show you how to care for your teeth whilst wearing them. You will change into your next aligner every one to two weeks and will start to notice your teeth straightening (usually after the first 8 weeks). Invisalign can be used in conjunction with restorative dentistry. This confident smile was created using Invisalign braces, whitening and replacement veneers. Widely spaced, gappy teeth are not a problem for the technology of Invisalign. 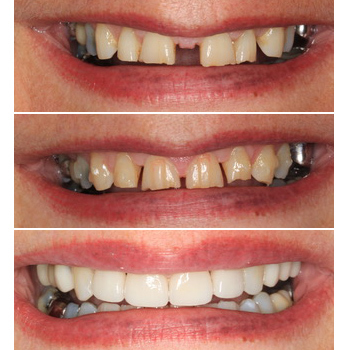 Treatment with Invisalign braces for just 9 months created this perfect spacing for the addition of porcelain veneers. Only 8 months of treatment was needed to get straight teeth with Invisalign braces. Aligned teeth make the task of dental hygiene easier, as it’s simpler to clean teeth. Can you see my Invisalign braces?